C/SPAN is an acronym for C/NN in Symbiosis with PANdora. In response to the exponential growth of Internet traffic, web proxy caches are deployed everywhere. Nonetheless their efficiency relies on a large number of intrinsically dynamic parameters most of which can not be predicted statically. Furthermore, in order to react to changing execution conditions — such as network resources, user behavior or flash crowds, or to update the web proxy with new protocols, services or even algorithms — the entire system must be dynamically adapted. Our response to this problem is a self-adapting Web proxy cache, called C/SPAN, that applies administrative strategies to adapt itself and react to external events. Because it is completely flexible, even these adaptation policies can be dynamically adapted. The World Wide Web has become a victim of its own success. The number of users and hosts, as well as the total traffic, exhibits exponential growth. To adress this issue, web proxy caches are being deployed almost every where, from organisation boundaries to ISPs. Since the efficiency of the caching system relies heavily on a large numbers of parameters (such as size, storage policy, cooperation strategies, etc), configuring them to maximize performance involves a great deal of expertise. Some of these parameters, such as user behavior, cannot be predicted statically (before deployement). Furthermore, because of the ever-changing nature of the web traffic, any configuration is unlikly to remain effective for long: benefits of inter-cache cooperation are subsequently reduced when cache contents tend to converge; effects like flash crowds or evolution in the users' interests and/or behavior require similar evolution in the web proxy's strategies to maintain good QoS. Consequently the need for dynamic adaptability in he web proxy caches seems obvious. Given the possibility of timely reconfiguration; a cache can be adapted each time its configuration ceases to be effective, as soon as a protocol appears or whenever the storage policy no longer matches user behavior, for example. manual configuration drastically increases the system's reaction time and thus the relevance of the adaptation. Indeed, not only might reconfiguration scripts require an in-depth knowledge of the cache's internals, thus becoming tricky to implement, but since a reconfiguration comes in response to an event it has to be applied quickly enough. Between the occurrence of the event and the end of the reconfiguration, the system may change, so that the reconfiguration is no longer suitable. Hence having an administrator monitor several caching systems in parallel and reconfigure them manually would not seem a reasonable option. C/SPAN is a dynamically adaptive web cache that applies administration policies to drive its own adaptation based on a dynamically flexible set of monitored events. As illustred in figure 1, C/SPAN relies on a completely open and flexible execution environment called YNVM (primarily, it is both a reflective dynamic compiler and a reflective dynamic library loader that provides dynamic flexibility to applications). And it is composed of a dynamically adaptive web cache called C/NN and a dynamically flexible monitoring platform called Pandora. Figure 1 – Architecture of C/SPAN. C/NN is an acronym for The Cache with No Name. C/NN is a reconfigurable Web proxy cache that relies on a high degree of reflexivity on its environment and the possibility for low-lovel intercession in its own execution. Because it is built directly over the YNVM, C/NN inherits its high degree of reflexivity, dynamism and flexibility and so provides "hot" replacement of policies, on line tuning of the cache and the ability to add arbitrary new caching functionality (performance evaluation, protocol tracing, debugging, and so on) or new proxy services (as in an active network environment) at any time, and to remove them when they are no longer needed. Our approach supports both initial configuration based on simulation, and dynamic adaptation of that configuration in response to observed changes in real traffic as they happen. C/NN is strutured as a set of basic policies responsible for handling HTTP request/response, caching the documents or cooperating with other Web proxy caches. The communication aspects are encapsulated in a component-based protocol stack, similar to the X-Kernel framework, as illustrated in Figure 2. Any protocol exports a low interface to be used by a lower-level protocol and an high interface for upper-level protocols, applications or services. 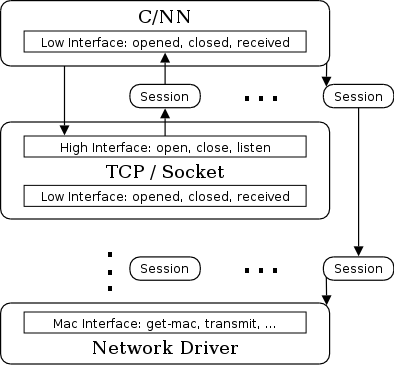 Incoming and outgoing packets are managed through a sessions stack, where a session represent, for a given protocol layer, a peer "local access point / remote access point". Figure 2 – Architecture of the protocols stack. Therefore, C/NN is considered as a service that is plugged into a generic proxy above the TCP protocol. This dynamically reconfigurable generic proxy supports dynamic construction of new services, from mobile code execution environment at the ethernet driver level up to TCP-based Web services. As a service, C/NN exports three call-back functions to the underlying protocol: opened and closed, to be notified of connections and disconnections, and received to receive incoming packet. C/NN's is structured internally as a set of "well-known" symbols bound to functions implementing the various policies. The reflexivity of the YNVM allow dynamic introspection to retrieve those symbols, as well as modification and recompilation of associated native code. The policy in charge of HTTP-requests has to classify them into categories (essentially HIT or MISS), possibly taking into account the request rate or the distance to the Web server to avoid caching nearby documents when heavily loaded. The policy dedicated to MISS requests will then have to decide whether or not to ask a neighbor for the document. The HTTP-response and HTTP-storage policies decide if the document should be stored and, if necessary, identifies documents to be evicted from the cache before storing the new documents. Other basic policies control the consistency of document and connection management, to enforce a certain quality of service among clients for example. Since these policies define the cache behavior, reconfiguring the cache essentially involves replacing them with others or defining new ones. Because of the reflexivity provided by the execution environment, policies can be manipulated as data. Therefore, the administration/reconfiguration of the cache can be expressed with scripts or agents executed inside the YNVM. Pandora is a general purpose monitoring platform. It offers a high level of flexibility while still achieving good performance. In this section we first present brievly the architecture of Pandora and its main characteristics. Then, we present in greater details the way Pandora interacts with C/NN. Finally, we describe how Pandora can monitor HTTP traffic. Each monitoring task executed by Pandora is split into fundamental, self-contained building blocks called components. These components are chained into stacks that constitute high-level tasks. Stack execution consists of components exchanging messages (data structures called "events") from the beginning of the stack, to the end. Options are component-specific parameters that modify or specialize component behavior. The range of application options is quite vast: it goes from a simple numerical parameters (a timeout for example) to the address of a function to call in particular conditions. Pandora provides a framework dealing with (amongst others) event demultiplexing, timers, threads and communication. This allows programmers to concentrate on the precise desired functionality and promotes code reuse. During stack execution, componentsare created as necessary and the resources they use are collected after some — user-specific — time of inactivity. Pandora may be configured in two different and complementary ways. First, at run time, Pandora reads static configuration files either from disk or from the network. Second, if told so, Pandora opens a control socket to which commands can be sent. These commands support querying the current configuration of the platform and performing arbitrary modifications on it. These modifications also affect the stacks being executed. Configuration itself includes stack definitions and component library localization. A stack definition specifies the exact chaining of components while the localization of a component tells Pandora which library to load in order to create the component. A single Pandora process is able to execute several stacks concurrently. Furthermore, a unique logical stack may ba split into several substacks. These substacks may be run either within distinct threads inside the same processor or within different process, possibly on distinct hosts. Pandora provides the require communication components to support such stack connections. There are two main techniques used by Pandora and C/NN to interact with each other. The first one involves public (re)configuration interfaces exported by Pandora. The second one makes use of the fact that Pandora and C/NN share � single address space. Pandora's interfaces allow one to inspect and modify its current state while it is running via three different kinds ofmethods: list, get and set. Listing methods give the complete set of a given type of element (E.G., running stacks, components in a stack definition, options exported by a component, etc). The get methods give a detailed description of one of those elements (e.g., the type of a component or the current value of an option). Finally, set methods may be used to modify any information obtained by one of the previous methods. All these functions apply equally to the static configuration of Pandora and to its dynamic state. Let's consider, for example, the value of an option. Using a get method on a static definition gives the default value of that option for a particular stack. Conversely, when applied to a running stack instance, the same method gives the current value of the option. A last set of functions control the execution of the stacks. These methods allows one to start and stop stacks remotly. Pandora's core engine is made of a single dynamic shared library. As much it may be loaded directly by the same YNVM instance as C/NN. Doing so enables C/NN and Pandora to share the same address space. Thus, it is possible for Pandora to call any function known to the YNVM, provided that it can find the address of the symbol it is interested in. Respectively, C/NN can use Pandora's API directly (without going through the above mentioned control socket). This enbales a potentially unlimited range of direct interactions between the two applications. Synchronization primitives, when needed, are provided by the YNVM. These two techniques may be combined. In such hybrid interaction, the address of a symbol is passed as an option to a dedicated component. This allows for maximum flexibility since even the choice of shared addresses may be reconfigured at run-time. request size: how many bytes are transferred during a complete transaction with the server (request and responze). Each of these may be considered either globally or clustered in some way (e.g. by server, by network, etc). The architecture of Pandora makes it possible to use various data sources and apply identical treatments on the information gathered from them. In order to do so, one only needs to provide appropriate components able to interpret the sources and reformat their content into Pandora's events. In our case, two data sources are avaible: raw network packets and C/NN itself. Indeed, Pandora is able to reconstruct a full HTTP trace from a passive network capture. This use of passive network monitoring allows us to capture all the metrics we need without any harm to the network and the servers (popular sites are not overloaded with active probes). However, this approach could be considered a little too "heavy-weight" in our context. This is why we also provide a component able to obtain the same kind of information directly from C/NN. This information is then used to build identical HTTP events. The choice of the right approach to follow remains the proxy cache administrator privilege. Further treatments on the collected events are processed by other dedicated components. In particular event clustering is made easy by the generic demultiplexing facilities provided by Pandora. As we were experimenting with live reconfiguration of C/NN, we found that most reconfigurations could be expressed as strategies and thus could be integrated directly as part of the cache. By increasing the autonomy of the cache we also increase its robustness (by avoiding manual reconfigurations), its effectiveness (by decreasing its reaction time) and its ease of administration. In order to reach this autonomy, with the resulting benefits in terms of reaction time or maintenance, administration policies can be dynamically loaded into the YNVM. Typically such a strategiy defines an action (adaptation) to be performed in response to an event. Then, Pandora is used to dynamically instantiate a monitoring stack responsible for notifying the strategy when the desired event occurs so that the corresponding adaptation can proceed. This approach is highly reflexive because the dynamic management of the cache is expressed in the same language that is used to implement the cache. The cache can be modified at any time. New functionality and policies can be introduced into the running cache, and the "current bindings" modified to activate them. It is therefore possible to rewrite arbitrary parts (or even all) of the cache implementation during execution. Most proxy caches have some kind of a "site exclusion list". All documents from servers or networks in this list are not cached but rather fetched directly. The main purpose of such list is to avoid overloading the proxy cache and filling the disk with documents for which caching would have no benefits. Usually, only servers located in the local network are put in this list. Indeed, under heavy load, documents located in nearby servers have few reasons to be cached. Figure 3 – Interactions between C/NN and Pandora for the management of the site exlusion list. The strategy that we follow is represented schematically in figure 3. When the cache (C/NN in this case) detects that its load is getting high (high request rate or slow response time), it asks Pandora to start monitoring request latencies. Latency, in our case, is defined by the interval between the time at which the last byte of the request was sent and the time at which the first byte of the response was received. As such, it only includes network latency and server latency (the time it needs to handle the request and prepare the response). In constrast to round-trip time measurements, this does not take into account the time actually needed to transfer the document over the network. These measurements are clustered by server and a representative value for each of them is computed iteratively. In the current implementation, this representative latency (simply called "server latency" for the sake of brevity in the following) is computed as the mean of the 100 last measurements for the server, with the 10 highest and 10 lowest values removed. At the same time, C/NN HTTP-response policy is adapted to use the newly created exclusion list before decinding whether or not to store a document. When some server latency falls below some "low threshold", the corresponding server address is added to the exclusion list. Later on, it it rises again above an "high threshold", it is removed from the list. Initially, these high and low water marks take default values — respectively 100 ms and 200 ms. However, according to the actual load of the cache and the time interval between document evictions (documents are actually removed in batches, until substantial space is freed — typically 15 % of the total cache space — in order to avoid doing the same operations at each requests), these numbers are dynamically adapted by increments of 10 ms. For exemple, when the request rate goes up by 10 requests par second over a 5 minutes interval, both low and high threshold are augmented by 10 ms. Similarly, if the average inter-eviction time decreases by 1 minute, the watermarks are decremented. This mechanism corresponds to a best-effort model: it allows the cache to keep response times low while providing an optimal quality of service fot its clients. Finally, when the cache load comes back to normal, the whole monitoring process is stopped and standard response policies are restored. All measurements are passive. They are taken only as actual requests are made to servers. This ensures that no additional load is imposed on popular servers, and thus does not disturb the accuracy of measurements. 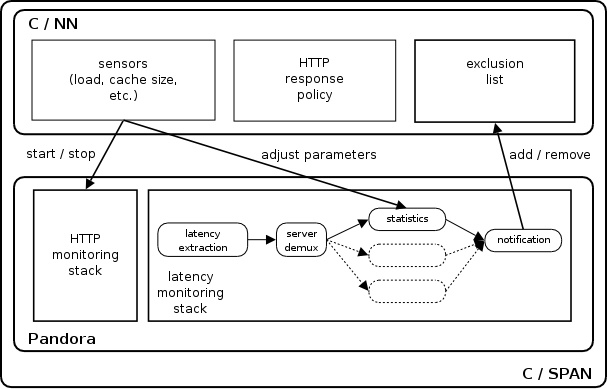 A single Pandora stack is responsible for the latency monitoring process. Its control (start and stop) and the modifications of the various parameters are made through a standard API that we mentioned before. For their part, additions to and removals from the exclusion are triggered by Pandora by direct calls of C/NN procedures. Another example is the addition of QoS management. Given a metric to classify users, an administration policy can enforce QoS between them in terms of network resource consumption (bandwith, response time, etc), as well as local resources (available space in cache). Dynamically introducing QoS management requires introducing resource allocation / consumption control mechanisms. This is done through the reconfiguration of several functions associated with the resources to be managed, such as the HTTP-storage policy for enabling per-user storage quotas or C/NN's opened and closed functions to start classifying user sessions according to a prioritized round-robin algorithm. Similarly, reconfiguring the received function of the underlying TCP component and the session's send function allows control of the bandwidth allocation among all TCP-based applications / services. Similar reconfigurations at a given service's level, such a C/NN, permits the control of bandwidth consumption among users, thus enforcing any given QoS policy. Since reservation-based QoS protocols are well-known for wasting resources, QoS management should not be active permanently, but only when resource availability is falling and best-effort is not suitable any longer. Therefore we use an adaptation strategy consisting of a set of monitors (one for each "critical" resource) and some adaptation code. When a resource's availability falls below some "low threshold", the corresponding adaptation code replaces the original function managing the resource by a "QoS-aware" one, that will enforce a pre-defined QoS policy for the resource. Thus dynamically adding new resources into QoS management is handled either by dynamically reconfiguring the adaptation strategy responsible for QoS management (adding a new monitor and the associated code) or by simply defining a new adaptation strategy dedicated to the QoS management of this new resource. Moreover, QoS policies can be dynamically adapted either by changing the adaptation code associated with a monitor in the adaptation strategy responsible for the QoS management or by directly reconfiguring / replacing the function controlling the resource. performance of the mechanisms supporting autonomy. First we evaluate the potential overhead of introducing dynamic flexibility and autonomy into a Web cache, by comparing C/SPAN to the widely used Squid cache (version 2.3) from an end-user point of view; that is, on the basis of their mean response time. We used several traces collected at INRIA (between 100,000 and 600,000 requests). Whereas Squid's mean response time was slightly more than 1 sec per request, C/SPAN's was about 0.83 sec. Using the YNVM as a specialized execution environment therefore does not introduced any performance penalty, compared to a statically-compiled C program. Another important metric is the "cost" of dynamic reconfiguration: it must not be intrusive. Since this " cost" is tied to the semantics of the reconfiguration, we evaluate the basic mechanisms supporting the reconfiguration process. Switching from one policy to another pre-defined policy involves only changing a symbol's binding and thus requires only changing a symbol's binding and thus requires only a few micro-seconds. As reconfiguration can imply defining new functionality or policies, its performance also relies on the dynamic compiler's performance. For example, defining (compiling from source) a new storage policy (Gree-Dual-Size) takes slightly more than 300 µs. This should be compared to the handling of a request, which represents about 130 µs for a HIT and 300 µs for a MISS. The mechanisms supporting dynamic adaptation are efficient enough that reconfiguration of the cache's policies does not interfere with its activity. Dynamic adaptation of the administration policies, which control the autonomous behavior of the Web proxy, does not rely just on these dynamic loading and compilation mechanisms but also on Pandora's dynamic monitoring stacks. To achieve autonomy, C/SPAN relies on component-based monitoring stacks. Experiments show that the overhead related to component chaining is limited to 75 ns per component per event, on a 1 GHz Pentium III processor, hence allowing very fast reaction times. Reconfiguration of the administration policies most often implies the activation of one or more new administration policies. This can be the result of either an external dynamic reconfiguration or an autonomous decision, in reaction to a monitored event. This operation involves two steps: (i) an optional dynamic compilation of the new strategy code (if it has not previously been defined); (ii) the dynamic construction of the required monitoring stacks. The time to dynamically compile a new policy is typically less than a few hundred microseconds. Figure 4 – Time to spawn a Pandora stack as a function of the number of components in the stack. We evaluated the creation time for stacks with a variable number of components. Each experiment involved the instantiation of the stack, the creation of every component in it and the destruction of the stack. 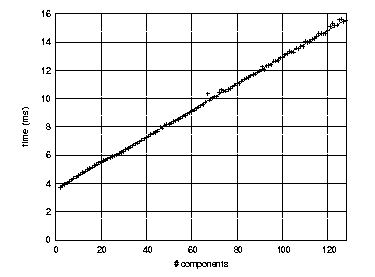 The dotted line in the graph shows that this time is linearly proportional to the number of components in the stack. The dotted line in the graph shows the observed the observed times (average over 1000 identical runs) and the solid line is the linear regression deduced from these observations. The squared correlation factor for the regression is r2 = 0.9992. The exact equation is thus: time = 3.55 . 10-3 + 9.40 . 10-5 . ncomponents (time is expressed in seconds). Both stacks (HTTP and ICP) used by C/NN contain less than 10 components. Dynamic stack spawning overhead is thus less than 5 ms. This tells us that stack creation and destruction is a relatively inexpensive operation. Furthermore, this kind of operation is done only occasionally (the period is in the order of hours): the overhead becomes negligible when averaged over the life-cycle of C/SPAN.